This piece is very special to us. 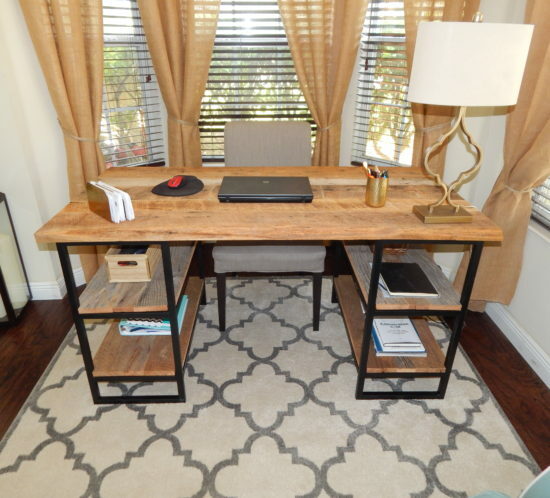 For a long time I have been asking Joe to please make me a Reclaimed Wood Desk with Metals Legs and finally I got it! When I gave Joe my design, I told him I wanted something with raw barn wood, meaning it has no polyurethane on it but it is sanded smooth so it is comfortable for everyday use. I also wanted a cool metal base with shelving to store things. Then I even got to hand pick all of barn wood boards there were used to build the desk. After some hard work and some awesome metal bases, I got the reclaimed wood desk I have always wanted! We have gotten so many compliments on it already and I look forward to using it for years to come. Carly and her husband Joe had us build them a gorgeous Reclaimed Wood Farmhouse Table and Bench for there new home. They both grew up in the northeast like us and wanted to bring some of that beauty into their house. So we went to work on this beautiful dining set. When Carly and Joe came to pick everything up and they instantly told us how much they loved it! They also said they couldn’t wait to do another project with us in the future! This set was made with 150 year old wood that come from a barn in northern Tennessee. A few months back, Robbie contacted us to purchase some reclaimed wood. He needed it for a custom bathroom vanity that he was going to have made. He wanted wood that was rich in character but grey in color to add a touch of rustic to his newly remodel bathroom. We sold him some gray barn wood from an old barn that we have taken down in Tennessee. The way this came out is absolutely beautiful! This was such a cool project! 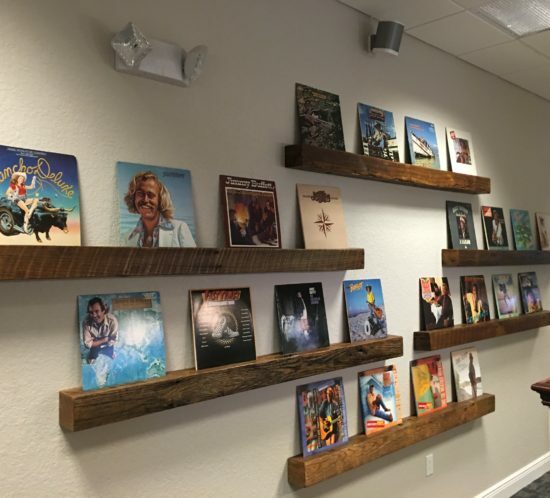 When Margaritaville Corporate headquarters contacted us to some custom reclaimed wood shelves and picture frame we were so excited. The shelves were going to be used to display all of Jimmy Buffet’s original albums in the corporate office. They had just moved into the space and they were looking for something rustic and beachy to give the office a good fun vibe that matches the brand. We went in and had a one on one consultation with Tyson who was heading up the project. After a great design meeting, we got to work and we love the final outcome! 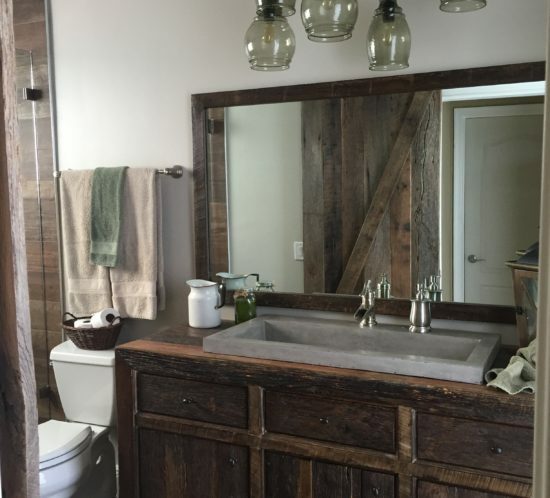 A few months back, Robbie contacted us to make him a customer reclaimed wood barn door for his bathroom. He wanted something very rich in character but cool in color. 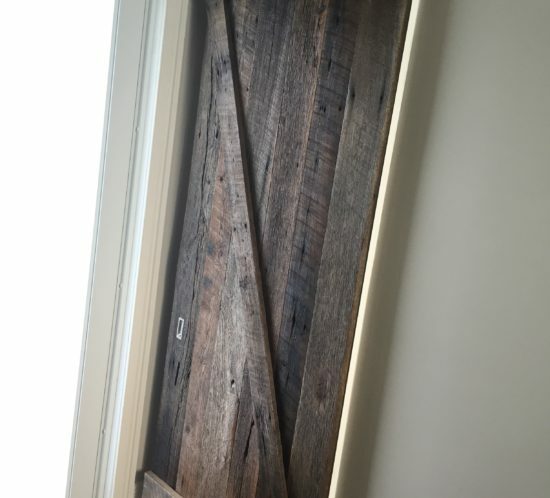 For this barn door we used gray barn wood from an old barn that we have taken down in Tennessee. The “Z” pattern on the door gives it a very traditional rustic look that you would find on a barn in the old days. Trevor and his wife came to us to build them a custom Reclaimed Wood Foyer Table with custom metal legs after we did custom reclaimed wood wall for them and a few projects for their good friends The Tarr’s. 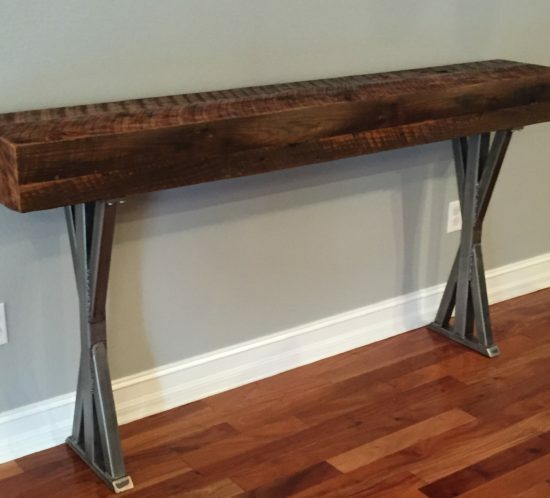 Use reclaimed barn wood for the top of the table and had the legs custom made exactly the way they wanted them with a raw steel finish. Trevor and his wife came to us to build them a custom Reclaimed Barn Wood Accent Wall with shelving after we did a few projects for their good friends The Tarr’s. He wanted something to that would be a focal point in the living room but also that would bring some character to the space. 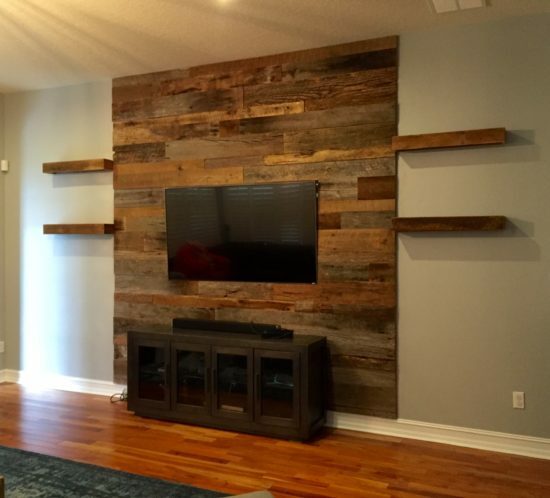 A reclaimed wood wall behind the TV was the way to go along with some nice floating shelves for decor. For this wall we used a 50/50 grey and brown color mix of barn wood. All of this wood came a barn we took down in northern Tennessee that was built back in the mid 1800’s. This wall has a ton of history in it and we are happy it will live on for many more years to come. Kristy contacted us via Etsy for one of our Reclaimed Wood Accent Wall Kits. We sell kits on Etsy that come ready for easy install for the do it yourself-er! Each kit is 100% real reclaimed barn wood that comes in varying depths of 1/2″-1″ thick and varying widths of 3″, 5″ and 7″ wide. All boards are cut, planed and lightly sanded and ready to mount on the wall. We also, prelay the pattern and label each board to make it even easier for you to install it your self. Kristy and her family live in Hoboken, NJ and wanted to add a little rustic touch to their home in the city. 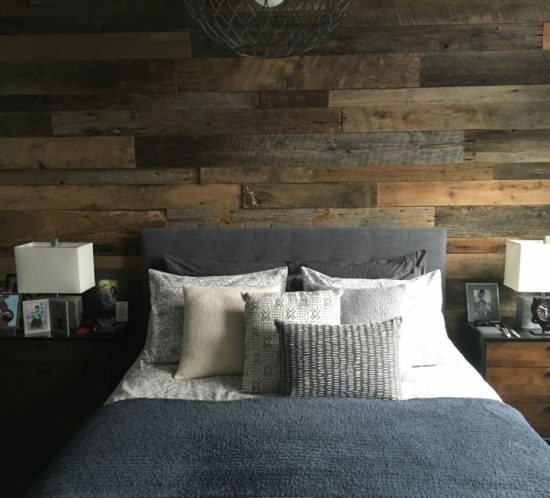 Our reclaimed barn wood accent walls are the perfect touch for master bedrooms. For this wall we used a 50/50 grey and brown color mix. This was one of our favorite projects yet! 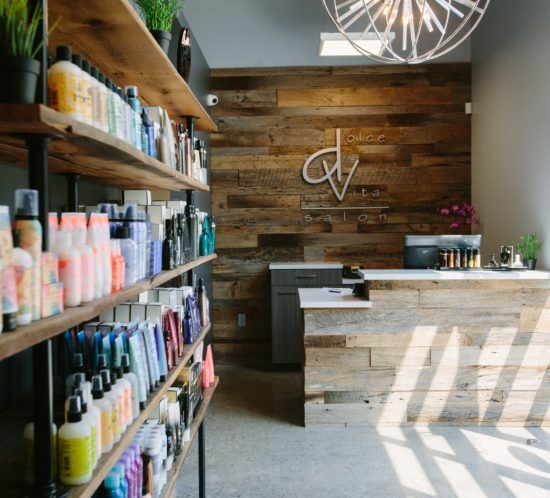 A local trendy hair salon, Dolce Vita was opening a new location in Winter Park, FL and asked us to do their Reclaimed Wood work. They had a very industrial space, so to add some character they wanted reclaimed barn wood. We built them a gorgeous Reclaimed Wood and Pipe retail rack for all of their product. Then we did a gorgeous wood accent wall and wrapped the front counter with barn wood. We also framed out all the station mirrors and built matching floating shelves. We are very of how this project came out! 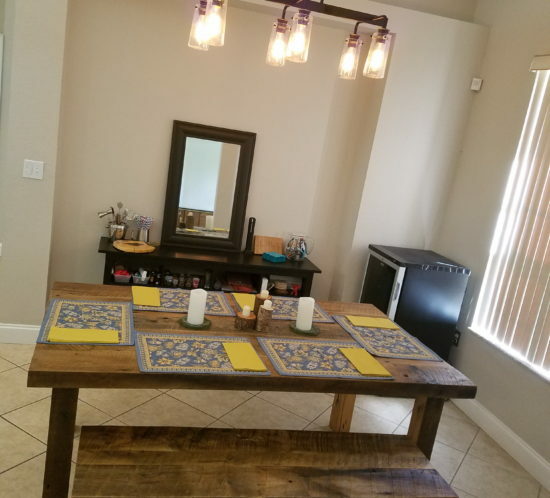 Dawn and her family contacted us to build them a custom Reclaimed Wood Farmhouse Dining Table and a Matching bench for their home. After a few weeks of planning and trip to Tennessee to pick up the barn wood, Dawn came to the shop and along with Joe, they choose each board that would be used for her project. So we went to work! We could not be more pleased with the final product. The table and bench have so much character. They go absolutely perfect in her Tuscan style home. This table was built using 2″ thick reclaimed wood boards that came from a barn in Tennessee that was built back in the mid 1800’s. Fama Creations. 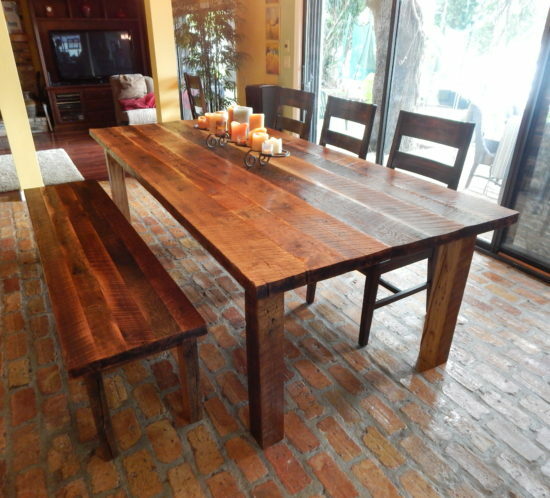 Orlando custom reclaimed furniture, reclaimed Wood Tables, wood furniture and home decor. Beautiful wood work, very professional. Job is done immaculate and in a timely matter. Joe is an excellent artist.